Matthew 20:17-19: Now as Jesus was going up to Jerusalem, he took the twelve disciples aside and said to them, "We are going up to Jerusalem, and the Son of Man will be betrayed to the chief priests and the teachers of the law. 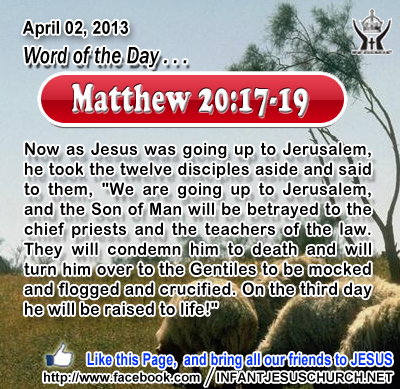 They will condemn him to death and will turn him over to the Gentiles to be mocked and flogged and crucified. On the third day he will be raised to life!" Heavenly Father, thank you for your plan to cover our sin with your grace by the death of your Son. May we live today aware of his sacrifice and confident of his victory over sin and death, so our life may reflect your victory. In the name of Infant Jesus, we pray. Amen. 11But Mary stood weeping outside the tomb, and as she wept she stooped to look into the tomb; 12 and she saw two angels in white, sitting where the body of Jesus had lain, one at the head and one at the feet. 13 They said to her, "Woman, why are you weeping?" She said to them, "Because they have taken away my Lord, and I do not know where they have laid him." 14 Saying this, she turned round and saw Jesus standing, but she did not know that it was Jesus. 15 Jesus said to her, "Woman, why are you weeping? Whom do you seek?" Supposing him to be the gardener, she said to him, "Sir, if you have carried him away, tell me where you have laid him, and I will take him away." 16 Jesus said to her, "Mary." She turned and said to him in Hebrew, "Rab-bo'ni!" (which means Teacher). 17 Jesus said to her, "Do not hold me, for I have not yet ascended to the Father; but go to my brethren and say to them, I am ascending to my Father and your Father, to my God and your God." 18 Mary Mag'dalene went and said to the disciples, "I have seen the Lord"; and she told them that he had said these things to her. The resurrection of Jesus is the base of our hope – the hope that we will see God face to face and share in his eternal glory and joy. Without having seen him we love him; though we do not now see him you believe in him and rejoice with unutterable and exalted joy. As the outcome of our faith we obtain the salvation of your souls. Do we recognize the Lord's presence with us, in his word, in the breaking of the bread, and in his church, the body of Christ? Loving Infant Jesus, may we never fail to recognize your voice nor lose sight of your existence in your life-giving word.